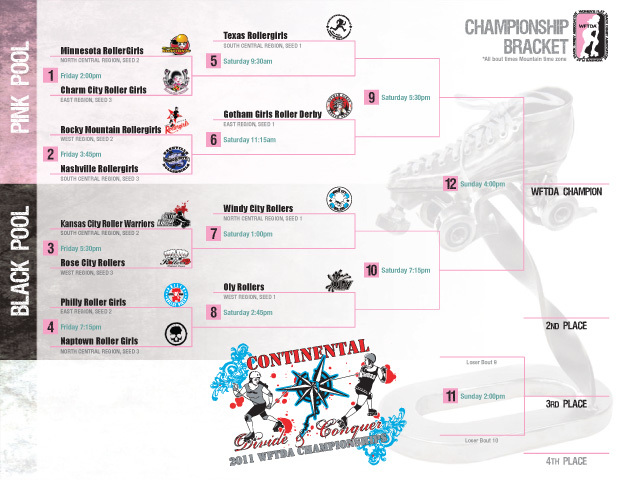 WFTDA would like to congratulate Gotham Girls Roller Derby of New York, NY on winning the 2011 Championship Tournament. The 2011 WFTDA tournament season came to an end on Nov. 13, 2011 after the top 12 seeds for the 2011 roller derby season faced off at the 1STBANK Center in Broomfield, CO, at an event hosted by the Denver Roller Dolls. Gotham became the first two-time Champion in WFTDA history, having also taken the title in 2008. At this year's Continental Divide and Conquer, Gotham (E #1) defeated defending Champions, Rocky Mountain Rollergirls (W #2) on Day 2, and went on to defeat 2009 Champions, Oly Rollers (W #1) in the Championship bout on the final day of the tournament. Check out our Big 5 Blog for tournament recaps and other features! Play our 2011 Big 5 Bracket Bonanza! Predict the winners in our Bracket Bonanaza game for a chance to win awesome prizes! See how it works! Click on "Predict It!" in the upper left corner to register and make your picks!